Continuing my exploration of intermediate reader books this year is leading to a lot of, judging books by their cover. And this time I hit the jackpot. Verity Gallant is miserable. Her family doesn’t understand her, and she has no friends (she’s around 12-ish, I guess). She visits the library one day and sees a mysterious stranger. He steals a book so she chases after him. 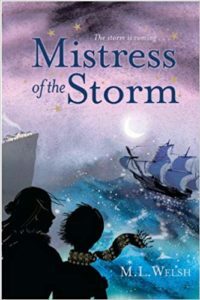 At the beach, before he sets sail, he hands her back the book and a round wooden ball with a strange statement, “The Storm is coming”. This sets off a series of events full of discovery, adventure, murder, insanity, sailing, friendship, and unexpected courage. And it’s fabulous! The writing is excellent, the characters are well developed, and who doesn’t love a girl coming of age story that’s not about getting a boyfriend or your period? Welsh easily captures the social awkwardness of being a young teen and not fitting in, and especially how deep those insults cut from others. Verity feels like a real girl: not instantly skilled at everything, “normal” looking, and really just wants to fit in enough to not stick out. I really loved the interpersonal relationships within the story, especially that she can be friends with a male character and it not immediately become a romance. The one flaw here is that it’s clearly set up to be an ongoing series. So much is laying the groundwork for future books… of which there is only one more. I want/need more! And neither of these are in print anymore. Clearly they didn’t sell well enough to continue, which is unfortunate because I loved this one so. They’re still available on Kindle at least, so if anyone, especially a young girl, is looking for a kick*ss coming of age book and dealing with social anxiety do I have a book for you. These are my new recommendations for sure. And yes, I will be hunting down print copies to sit on my own shelves to someday be discovered by my own growing girl.